Please post any questions, criticisms, or concerns here. There's still a noticeable 'lag' or hitch if the scan is used. The sounds of the turn play immediately but the animation doesn't kick in until a second later. The weapon/set course selection highlighting is not consistent. At the start or right after a turn has taken place, when you press a weapon you just get that super faint grey selection box. When you target the weapon turns yellow. But if you then select another weapon, the selected weapon turns yellow /white text. [and then it goes to yellow/black text when the target is set. I know what's happening from the audio cues but the visual selections are confusing. Then if you choose set course and pick a target destination square... nothing visual happens to that button (the audio cue plays). If an enemy ship is firing a particle beam and is destroyed, the particle beam continues to fire. a kind of meaningless visual suggestion (which you can ignore since I don't think it would benefit anything): there should be a little sparkle where a) two particle beams intersect b) when a torpedo hits a particle beam c) when two torpedoes collide. I know you do know the locations of b) and c) because you're destroying the torpedoes on collisions. It's kind of vaguely disappointing when the torpedoes just 'vanish'. if there was a small explosion it tells the user something happened. The playing of the 'torpedo hit' sound can be inconsistent when playing against multiple enemy ships. Sometimes it plays but not always. It's a little awkward to reproduce but if two torpedoes hit the ship at almost the same time the sound does not play. This also sometimes occurs if a particle beam hits the ship and a torpedo hits it after. 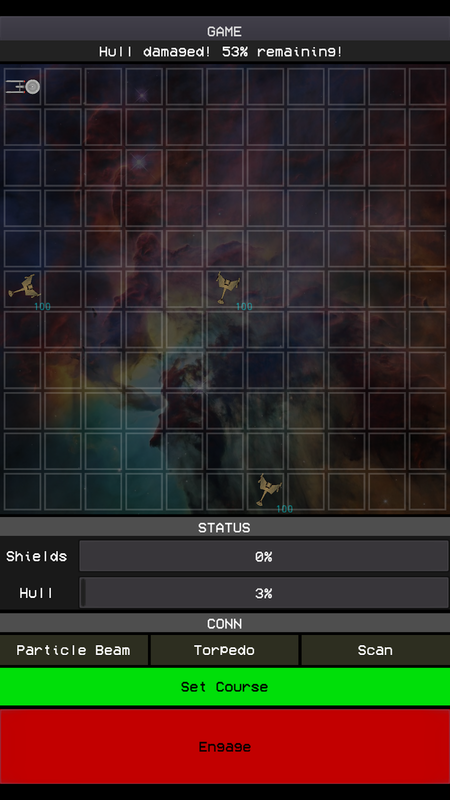 The 'damage remaining' % at the top of the screen can be inconsistent with the Status Shield/Hull Percentages in the control area at the bottom. This can often be reproduced in multi-opponent mode: Start the game. Just hit engage (don't fire, don't move). Assuming your ship survives, hit engage again. If there is a torpedo + particle beam shot (and your ship survives), the resultant damage message often is inconsistent with the status %. Amazing as always! Thank you Nate! Expect an update soon!